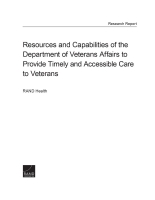 Does not include Appendixes C-G.
What are VA's current resources and capabilities? What are current levels of access to VA care? What is the quality of VA care? What are VA's projected resources and capabilities to provide timely and accessible care, and how might different policies enhance VA's resources and capabilities for treating veterans in the future? The Veterans Access, Choice, and Accountability Act of 2014 addressed the need for access to timely, high-quality health care for veterans. Section 201 of the legislation called for an independent assessment of various aspects of veterans' health care. The RAND Corporation was tasked with an assessment of the Department of Veterans Affairs (VA's) current and projected health care capabilities and resources. An examination of data from a variety of sources, along with a survey of VA medical facility leaders, revealed the breadth and depth of VA resources and capabilities: fiscal resources, workforce and human resources, physical infrastructure, interorganizational relationships, and information resources. The assessment identified barriers to the effective use of these resources and capabilities. 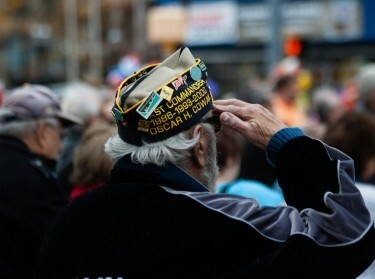 Analysis of data on access to VA care and the quality of that care showed that almost all veterans live within 40 miles of a VA health facility, but fewer have access to VA specialty care. Veterans usually receive care within 14 days of their desired appointment date, but wait times vary considerably across VA facilities. VA has long played a national leadership role in measuring the quality of health care. 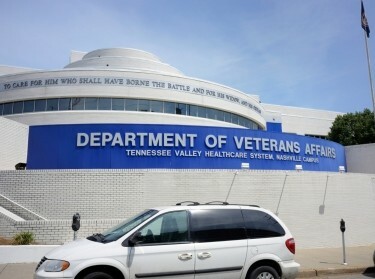 The assessment showed that VA health care quality was as good or better on most measures compared with other health systems, but quality performance lagged at some VA facilities. VA will require more resources and capabilities to meet a projected increase in veterans' demand for VA care over the next five years. Options for increasing capacity include accelerated hiring, full nurse practice authority, and expanded use of telehealth. VA is one of the largest health providers in the world, but its workforce and facility capacity may not be sufficient to provide timely care to veterans across a number of key specialties, as well as primary care. Purchased care offers one solution to these limitations, but VA faces challenges in managing this option. Accelerated hiring and productivity increases, aided by technology, will be necessary if VA is to meet an anticipated increase in demand for care over the next five years. The vast majority of veterans live within 40 miles of VA care but actual geographic access varies according to the access standard used and by region and type of service. According to VA standards, most veterans do not face long waits for care, but there is considerable variation in timeliness across facilities. VA patients report that they are less likely than private-sector patients to get appointments as soon as needed. VA's timeliness standard is much less demanding than the standards used in the private sector. VA outpatient care outperformed non-VA outpatient care on almost all quality measures. VA hospitals performed the same or better than non-VA hospitals on most inpatient quality measures, but worse on others. Although most VA facilities maintain high levels of quality, there is variation across facilities, with best practices not universally identified or adopted. VA should take significant steps to improve access to care. It should use a systematic, continuous performance improvement process to reduce variability in access to care and evaluate options for increasing its capacity, including hiring additional providers, granting advanced practice nurses full practice authority, and increasing the use of virtual care. VA should systematically identify opportunities to improve access through the use of purchased care. It should streamline programs for purchasing care and use them strategically to minimize cost. VA should reexamine its standards for timely access to care and consider alternatives. Specifically, it should examine the utility of existing benchmarks, such as same-day availability of appointments, used in other health care systems. VA and Congress should develop and implement more sensitive standards for geographic access to care. Better data collection and analysis would help VA determine where veterans are facing geographic access barriers and where purchased care could fill access gaps. VA should establish itself as a leader and innovator in health care redesign. VA has historically been on the forefront of health care innovations, and being a large, integrated delivery system positions it to continue to do so. Carrie M. Farmer @carriefarmer, Susan D. Hosek, et al. The research described in this report was sponsored by the U.S. Department of Veterans Affairs and conducted by RAND Health, a division of the RAND Corporation. Hussey, Peter S., Jeanne S. Ringel, Sangeeta C. Ahluwalia, Rebecca Anhang Price, Christine Buttorff, Thomas W. Concannon, Susan L. Lovejoy, Grant R. Martsolf, Robert S. Rudin, Dana Schultz, Elizabeth M. Sloss, Katherine E. Watkins, Daniel A. Waxman, Melissa Bauman, Brian Briscombe, James R. Broyles, Rachel M. Burns, Emily K. Chen, Amy Soo Jin DeSantis, Liisa Ecola, Shira H. Fischer, Mark W. Friedberg, Courtney A. Gidengil, Paul B. Ginsburg, Timothy R. Gulden, Carlos Ignacio Gutierrez, Samuel Hirshman, Christina Y. Huang, Ryan Kandrack, Amii M. Kress, Kristin J. Leuschner, Sarah MacCarthy, Ervant J. Maksabedian Hernandez, Sean Mann, Luke J. Matthews, Linnea Warren May, Nishtha Mishra, Lisa Kraus, Ashley N. Muchow, Jason Nelson, Diana Naranjo, Claire E. O'Hanlon, Francesca Pillemer, Zachary Predmore, Rachel Ross, Teague Ruder, Carolyn M. Rutter, Lori Uscher-Pines, Mary E. Vaiana, Joseph Vesely, Susan D. Hosek, and Carrie M. Farmer, Resources and Capabilities of the Department of Veterans Affairs to Provide Timely and Accessible Care to Veterans. Santa Monica, CA: RAND Corporation, 2015. https://www.rand.org/pubs/research_reports/RR1165z2.html.